Shown here on the Hartford door style in Maple. Van Dyke Brown is a Custom Tinted Varnish  nish. Shown here on the Riverdale door style in Maple. Butterscotch is a Stain  nish. 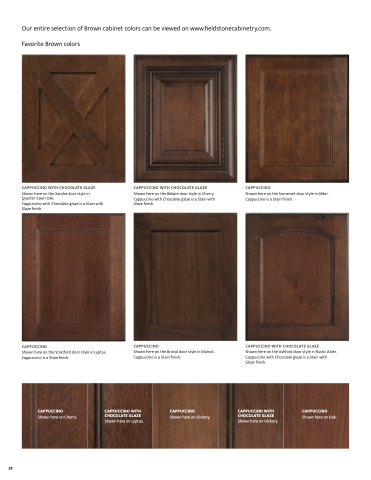 Shown here on the Recina door style in Maple. Butterscotch with Chocolate glaze is a Stain with Glaze  nish. Shown here on the Hampton door style in Maple. Butterscotch with Nickel glaze is a Stain with Glaze  nish. Shown here on the Rockingham door style in Alder. Butterscotch with Ebony glaze is a Stain with Glaze  nish.